I stayed quiet though, as the reason he was unpacking was to give out the goods. 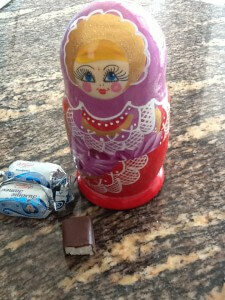 Averi received a beautiful Matryoshka doll. And he brought a couple of bags of this seriously delicious candy. It’s chocolate covered something white. 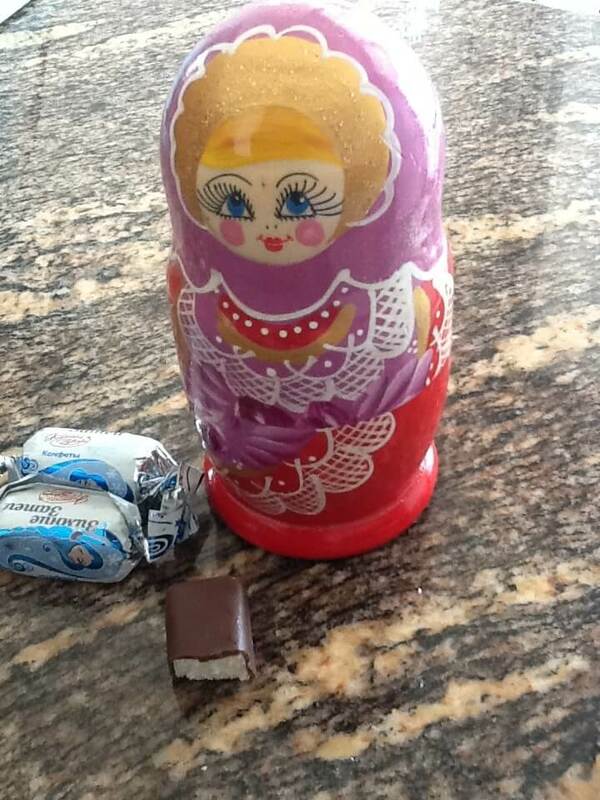 No clue what the something white is, as it’s all written in Russian. But it’s delicious. If you know what it is, only tell me if it won’t gross me out. 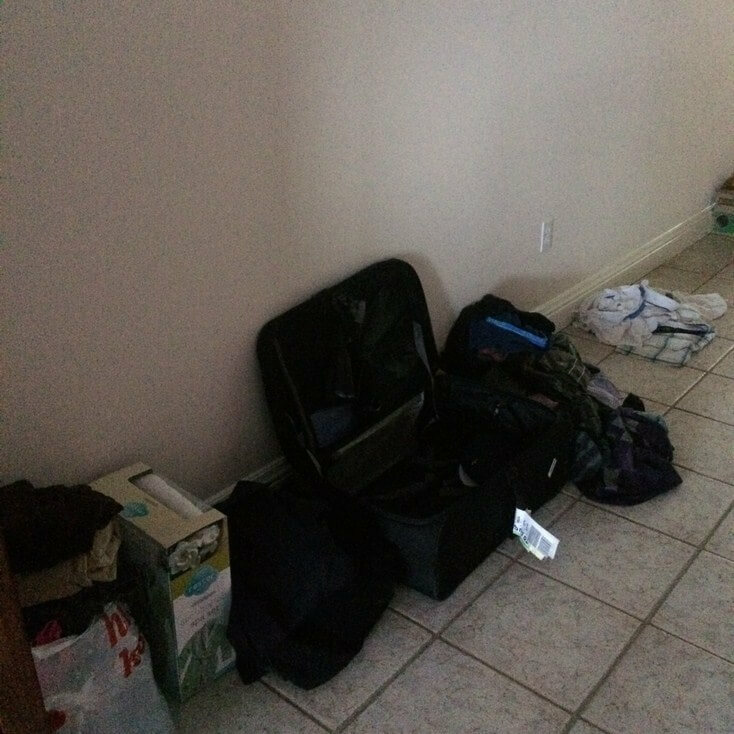 Then he started pulling out dirty clothes (that would be the piles you see next to the suitcases in the first pic) and stuff to bring to work (some of the bags from the second pic). Would you believe he didn’t get me one?! And then, to add insult to injury, he said it was because the jewelry he saw was to nice! As if a nice piece of jewelry wouldn’t look right with my target brand workout clothes. Or my tank tops from Kohls. In the meantime, I plan on keeping both bags of the chocolates for myself as a consolation prize. Even though one bag was meant for his office here. Instead, I will let Michael bring them some of the Upside Down Peaches and Strawberry Cake I made. Because I am generous, and always thinking of others. And because I had two peaches that were on verge of needing to be thrown out. I found the original recipe on reluctantentertainer.com. I loved the simplicity of it – it seriously took like all of 10 minutes to make. 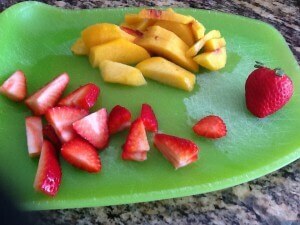 I also love that its a recipe where you can easily interchange the fruit used. So while I did still use peaches, I also added in strawberries. This was not only because I didn’t have enough peaches after I started snacking while slicing, but also because I love the peach and strawberry combo. 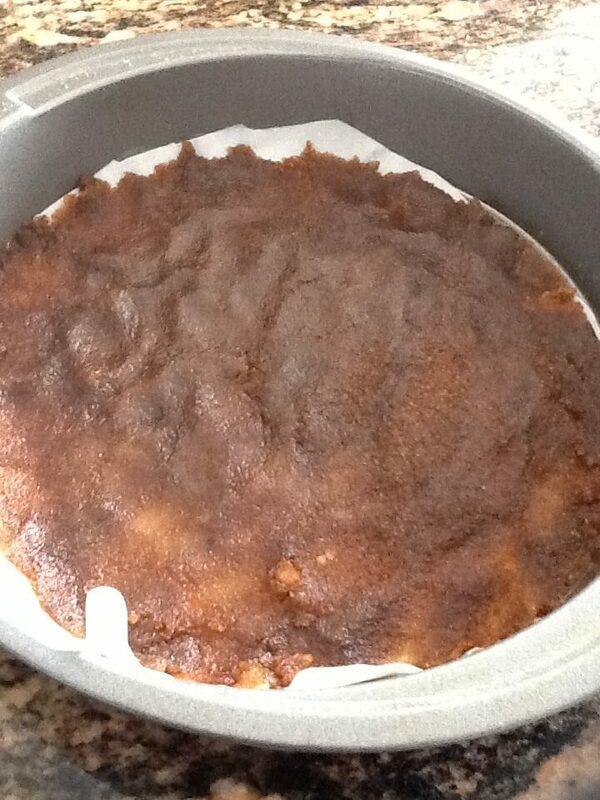 I also used 1/4 cup light brown sugar and 1/4 dark brown sugar. 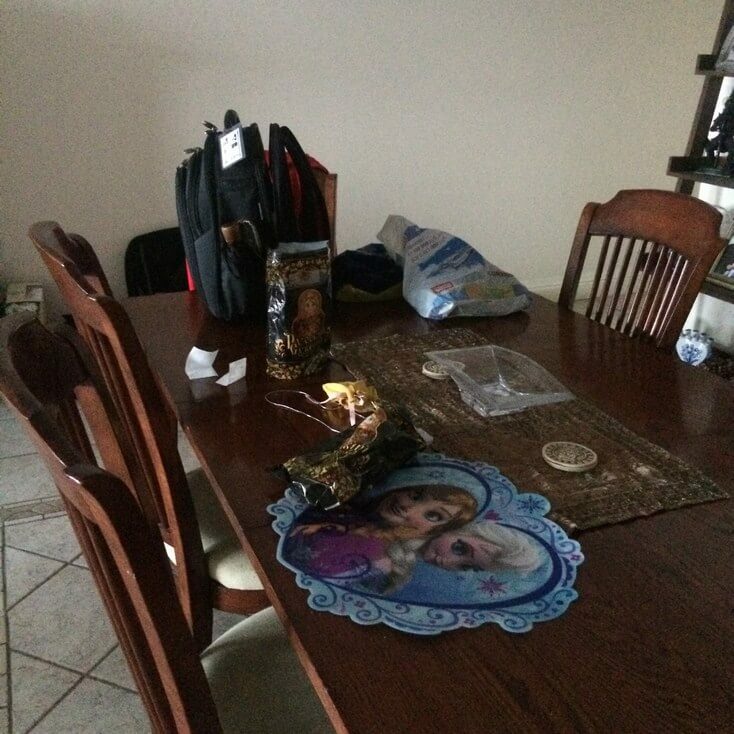 No real reason behind it, other then I had a 1/4 cup of light left and wanted to be able to throw out the bag. The resulting cake is fantastic. The caramely brown sugar and butter topping makes for a sticky, crunchy texture. 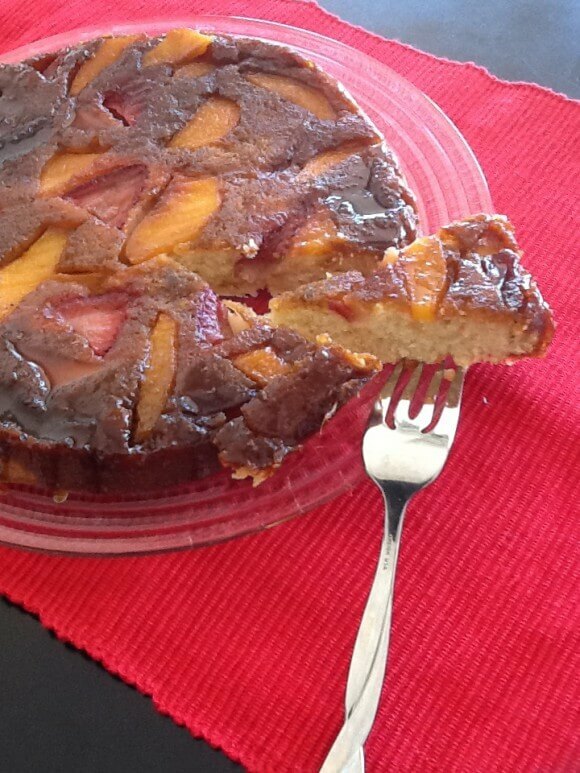 Plus the topping also makes for a pretty cake, with the fruit showing through. The cake itself is very moist. And the strawberry and peach combo is as sweet and flavorful as I expected it to be. Melt 2 tbsp of butter. Add the brown sugar to the melted butter, and mix. 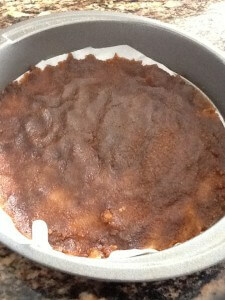 Spread evenly in a round cake pan that has been sprayed and lined with parchment paper. 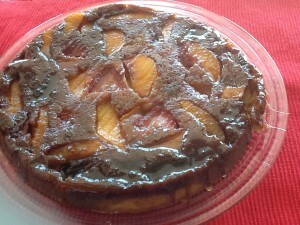 Place peach and strawberry pieces on top of brown sugar mixture. Add the white sugar, flour, salt and baking powder in a mixing bowl. Add remaining 6 tbsp butter, and mix. Add in milk, vanilla and eggs. Beat until combined. Pour the batter over the fruit. Bake for 35 minutes, or until set.